Musical delight: Phil Mountford and members of Fordante. WHAT does a busy film composer, session musician and music writer do on his night off? He plays music with his own orchestra… of course. 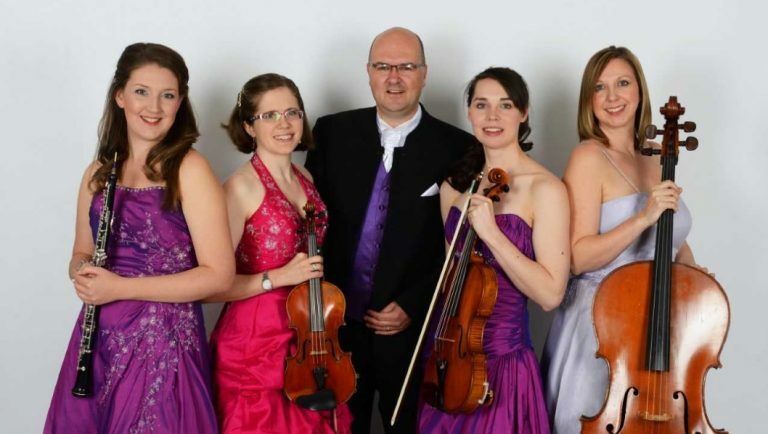 Phil Mountford, award winning composer of film soundtracks, TV commercials and highly regarded classical pieces, is the driving force behind Fordante, a critically acclaimed five-piece ensemble of violin, cello, viola, oboe and keyboard. Together they perform pieces from the light classical repertoire and movie music. Currently on an international tour, Fordante are stopping off in Feckenham with a spectacular new concert ‘Romance to the Movies’ which contains some of the most beautiful light classics, opera arias and movie music ever written. They’re at Feckenham Village Hall on Sunday, April 7 at 7.30pm and concert show will includes a wonderful mix of popular film music from Moon River, The Gladfly, Gone With The Wind, A Summer Place to well known classics such as the Swan Lake Waltz, Intermezzo, Gold and Silver Waltz along with a handful of Fordante’s original music plus a sprinkle of surprises to get the audience singing along. The show’s been described as ‘Like André Rieu with a smaller orchestra’ and it’s suitable for absolutely anyone who enjoys music. The show is at 7.30pm in Feckenham Village Hall and tickets are £10 from The Village Shop and The Rose and Crown in Feckenham. You can also book online at www.ticketsource.co.uk/feckenham or by phone on 0333 666 3366.